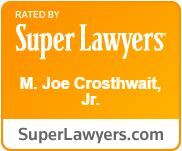 If you have been injured in a car accident or at work, or if another person, business, or entity has harmed you through their careless or negligent actions, contact The Crosthwait Law Firm as soon as possible so we can evaluate your case, determine the amount of compensation to which you are entitled, and recover that amount for you, from the responsible parties. The experienced and compassionate attorneys at The Crosthwait Law Firm understand that such an accident can affect your life for years. Repair bills and medical bills can add up quickly, and your injuries could cause you chronic pain or other serious problems. If you have been injured by the carelessness of another, you deserve to be compensated. Whatever your situation, we will do everything we can to get you the answers you need in the most reliable and cost-effective manner.